Starting a new career or a job seems not so easy, as it appears. There are certain plans which need to be considered before starting a new successful career or a job. The levels of securing a new job may consist of time management if a candidate expects a permanent career in that particular company. And make sure that your efforts overachieving this particular opportunity of working in that company comes to benefit, hence it is necessary to follow the 30-60-90 day plan. The 30-60-90 day plan for securing a new job consists of certain levels of portions and those portions can be such as learning stage, communicating stage and transformation stage. And to make that plan successful, a person needs to follow all the below mentioned points. In this learning stage, a candidate who has been appointed recently in the company needs to understand the essential elements of the company. Most commonly it happens that newly hired employees forget to learn about their employed company because of joining the excitement. Therefore, all the candidates who are new to the company need to learn all the details about the company. In this stage, an employee who had been appointed recently to the company needs to start communicating himself/herself to the company. It means that after collecting all the essential details about the company, an employer needs to know that after the learning stage it is time to introduce the strengths of an individual to the company. An employee needs to start building his / her impression on the employers of the company. As mentioned above it is the transformation stage where in which a newly appointed employee needs to grab opportunity to showcase themselves. After an employee introduces his / her innovative ideas and makes the count in the overall development of the company then it is time to start taking leadership of such responsibilities. In the previous 60 day plan, an employee needs to make sure that his / her skills and abilities are considered good so that they can prove themselves in the transformation stage. As mentioned above the 30-60-90 days plan to secure a new job is a process where all the stages already mentioned are considered while delivering an actual action. 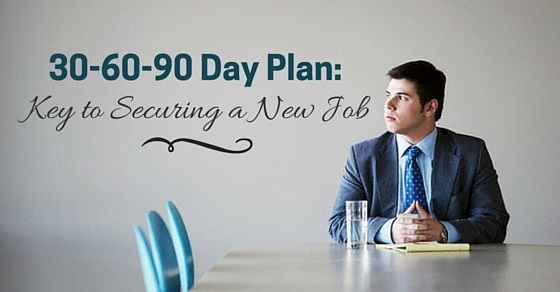 Here are some of an effective common strategy to start a new job using a 30-60-90 day plan and they are as follows. This is a very first stage that can create a change in employment strategies or guidance. There is a possibility that the introduction stage consists of those elements of the company where all the details about the company are maintained in a protective manner. On this designing stage, a newly appointed employee needs to collect all the information about the company, the strategic plans of the company and also their current status in the business market. As mentioned above, this plan consists of some stages of securing a new job where it declares a learning stage of 30-day plan which is the main stage where an employee who has been recently appointed collects all the information about the company. The second stage would be 60- day plan that is the communication stage, which consists of all the activities, skills and abilities showcasing stage for the overall growth of the company and the final stage is the transformation stage of 90 day plan where an employee grabs an opportunity to prove his / her skill for the development of the company. In this newly appointed job, an employee needs to keep in mind that it is very much necessary to understand all the important details about the company. The information about company mainly consists of all the strategic plans which can be useful during the time of development of the company. When an employee studies about the company while joining, the employee can be benefited with the credit points of the company. An introduction stage provides all the information about the company, in which it creates a strong base of the relevant information. After that, it is very necessary to understand the actual working environment of the company. And that would be understanding the company policy and rules. To know more about company policy an employer needs to schedule a meeting with the team members. Therefore, all these kind of information helps an employee to be aware of the relevant rules about the company. While scheduling a meeting an employer needs to know more about the evaluation process. It can help an employee to evaluate his / her own performance in the company. And eventually, it will create an image about all the performance details of a company. Therefore, it is possible that by collecting information or meeting a manager makes things better for a new employee to be aware of all the evaluation performance criteria. Before taking over the role assigned to the newly appointed employee, that particular employee need to know more information about the role which has been assigned to him/her. And can be delivered with some of the details about the role of the person who used to handle that role previously. Therefore, at the end of the session, an employee will be able to handle all the working roles of the position assigned to him/her with the help of a former employee. While taking over the roles about the position assigned to him/her, an employee needs to clear all the doubts and questions about the role and the position assigned to him/her by consulting the relevant employee. If there are any doubts or questions about the company or roles, it is best if an employee clears it before starting a new job in that company. Once all the legal and technical regulation of a company is over then it is time to start a job. And to that, an employee needs to aim at showcasing his / her skills and abilities which can be benefited for the overall development of the company. Therefore, to make that happen an employee needs to execute excellent performance where the performance of that employee should be noticed by everybody. Once an employee gets over with all the legal documents of the company, an employee needs to be noticed by all the important individuals of the company by his / her excellent track record in very less time. It is important to contact all those network heads who have really helped that employee to make sure that he/she receive that job. Therefore, by connecting with those networks and informing about an achievement can make them part of a successful career. Therefore, this 30-60-90 day plan for securing a new job can build an environment where an employee can plan his / her success story within a 30-60-90 day. If a person really wants to achieve something in his / her life, then it is time that he/she should follow all the above-mentioned guidance to secure a new job by using a simple plan for 30-60-90 days.